Welcome to the Photography Friday Blog hop. I am a huge fan of link-ups, and always love participating in them. However, I have found very few (actually, none so far) that focus on Photography. So each week I want to encourage you to get out and take some photos! It doesn't matter what Camera you have - an iPhone, a DSLR, a film camera, an instax - Just get out and press that shutter! Blog about your photographic awesomeness and link up here to share it Every Friday. Hope everyone had a wonderful Halloween! This week has been pretty damn cold around these parts. Wednesday I had to clean snow off my car before work, and Thursday it poured the entire day & night (poor Trick or Treaters!) so I haven't exactly been strolling about with my camera lately. I feel these film shots capture the mood lately - cold outside, warm inside, and lots of Kitty Snuggles! You may recognize Sarah, as she co-hosted the very first Photography Friday! 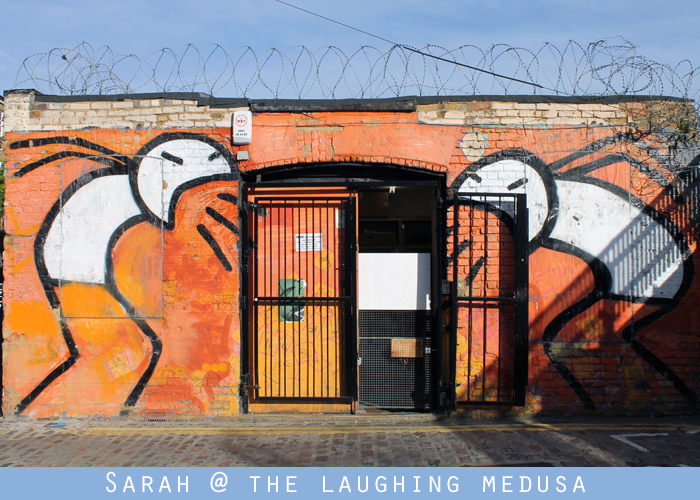 Sarah is now living in London, England, and this week she shared some awesome photographs of Street art from one of her favorite places, The Brick Lane. Go check out her wonderful blog The Laughing Medusa. love these link ups jess! going to enter every week as it gets me to see so many cool blogs!